Renovation Stage 1: From the Window to the Wall. One of the first changes we made when we began our renovation back in late October 2016 was breaking out this wall that blocked visual access to each of the large rooms to make one cohesive space. Opening up the wall created additional bar seating, allowing people in both rooms to feel they were enjoying the same experience. If you’re in the game room playing pool or sitting at a booth, you still feel like you’re a part of what’s going on in the main bar room and vice versa. You can sit anywhere and enjoy live music, karaoke or the DJ and dancing on the weekends, and bartenders can see all the way to the front door and even out the windows right from behind the bar. It’s functional and efficient and created an openly energetic flow that just FEELS good. Although we started many projects in the old Royal Oak building simultaneously and worked on each little by little as such until completion, the very VERY first thing we did was remove the wall that closed off the two large rooms, what have come to be known as The Game Room (right off the entryway) and The Main Bar Room (just beyond the entryway), and in doing so, it opened up the space completely, making such an incredible difference we knew would be important. Because we are first, a bar and not a fine dining restaurant, we wanted to be able to have a full line of vision from the main bar to the game room and to the front door, and this accomplished just that while also creating a really nice flow in the entire space. This is the wall that once separated the two large rooms. The photo above shows the view from near the entryway looking through the game room and the photo below is looking from the main bar room towards the game room. However, the wall completely blocks any view of either. The goal was to remove the drywall and studs, leaving the beams and ponywall to create a partial bar with seats on either side to share the space. The doorway at the end was also enlarged, as it was originally a standard narrow doorway just off of the kitchen door. We did all of the work ourselves here, and in most of the renovation as well. Every single project we started in this old building turned into about 10 more headaches, as is the case with construction and converting old spaces into new and updating and creating new functional spaces which also meet all the new codes. Looking back, we had a blast and are so happy with the way it turned out, even though the process felt like a complete nightmare. We began construction in late October 2016, but so many things needed to be done in the interim that we couldn't quite finish one project until we finished ten others, so once the windows were out and framed, this section took a bit of a backseat to all the other work that was going on. We worked through the winter months without a working heater and with only a few propane tanks warming the area, and let me tell you, IT WAS COLD. We were freezing and we worked mostly nights -all night and into the morning on many occasions and had to wear at least 4 layers and a jacket on some nights and we were working INSIDE. We also had one of the hardest winters in years (though apparently nothing in comparison to many MANY years ago) but it was definitely a challenge and made the renovation much more difficult and time consuming. This photo was taken on January 30th 2017 and it aligned with the photos as to where were in the renovation process at that point. Above you can see a little more progress in the area. 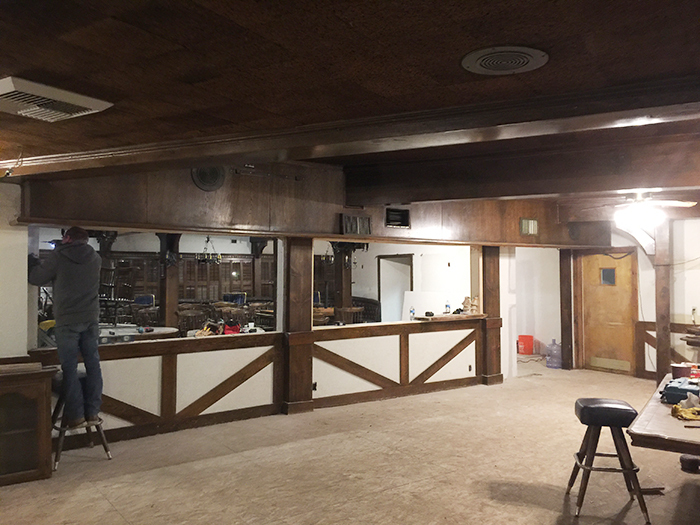 The slanted wood panels have been removed from the lower wall and the wood and beams in the main bar room have all been sanded down to natural. The stools you see in the first photo below are original from the Royal Oak, & used to stage the area to see how it would work for seating. In the photos below you can see a lot more demo work had been done to the space by this point. I believe it was around February-March 2017 and the textured walls had been smoothed out (we hired out for that), the reclaimed wood had been mounted to the soffit above the open bar window and behind the main bar and soffit above that area as well (which we did) and began scraping that old nasty cork off the ceilings in certain areas. . .
We wanted to use large slabs of wood with raw edges for our bar tops in this space and if you notice in the third photo above, we were testing out different sized samples to see what would work the best. We went through a few different staining techniques until we finally found the perfect rustic-raw-reclaimed wood look with all of its imperfections. A local wood worker named Keith Knight -who also created our exterior sign and the sign you see in the photo below, created the thick bar tops for us and they turned out really beautiful! These photos obviously jump forward quite a bit as far as the rest of the renovation is concerned… but I’ll eventually share the entire renovation so it will all line up. Without giving away too much of the space, since this is just the beginning, here are a few of the final cut out window below – now that we’re open. * The stools are all from Bay Furnishings, who were a dream to work with! Quite a big difference form the original space! Now all you have to do is stop by and see it for yourself!